My oldest daughter turned three years old on January 1st, and she is madly in love with Disney’s “Tangled” movie. She is obsessed with all things “Rapunzel”, and loves to dress up in princess dresses and dance around the house. When I asked her what type of party she’s like, I listed a Rapunzel Party as an option and her eyes instantly lit up. That was the one! 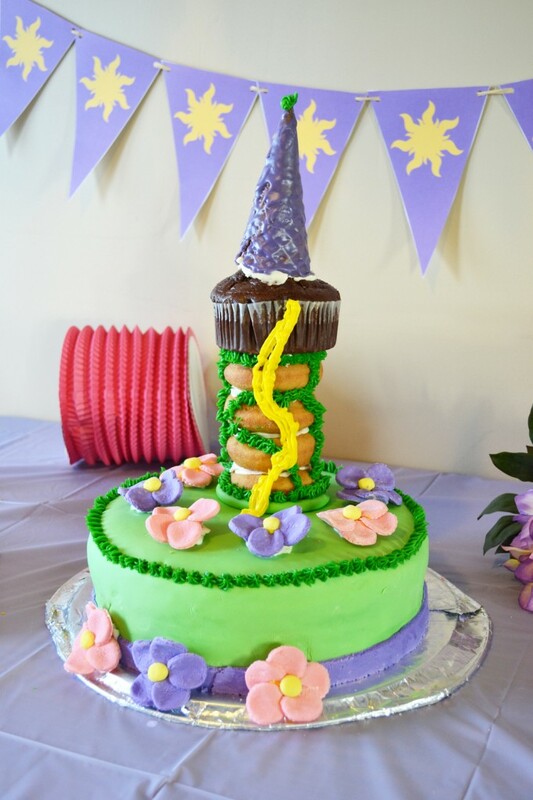 Between Pinterest and some fantastic crafting blogs I follow, I managed to come up with a completely DIY Rapunzel-themed party for a low cost. It was a lot of work, but my daughter loved it! The cake was the most difficult part, and it was inspired by this cake, this cake and this cake. I started with rainbow bit cake mix, baked two 10″ round cakes and layered them with a purple buttercream icing. Then, I iced the entire cake in purple buttercream and made marshmallow fondant with this recipe. I personally had a difficult time working with the fondant (it was either too sticky or, when I added more icing sugar, it broke easily). I’m hoping it’s a skill that just takes time! I dyed half of the fondant green and put it over the cake, and then used a small lid to cut circles out of the remaining fondant that I had dyed purple and pink. I arranged the circles to create the flowers (I glued the petals together with buttercream icing) and rolled a small ball out of yellow fondant for the centers. I added a strip of purple fondant to the bottom of the cake and arranged the flowers in a semi-circle on the top of the cake. For the tower, I purchased cake donuts and a large chocolate muffin. I stacked those together and “glued” them all in place with a lot of buttercream icing. For the top of the tower, I dipped a waffle cone in some white chocolate that I had dyed purple and then I attached the cone to the muffin with buttercream icing. Finally, I added green vines, yellow hair, and grass detailing to the cake with buttercream icing. Overall I was satisfied with the cake, though the tower fell after a few hours! I’d suggest some sort of dowel system to make it last better! I kept the party decor relatively simple. 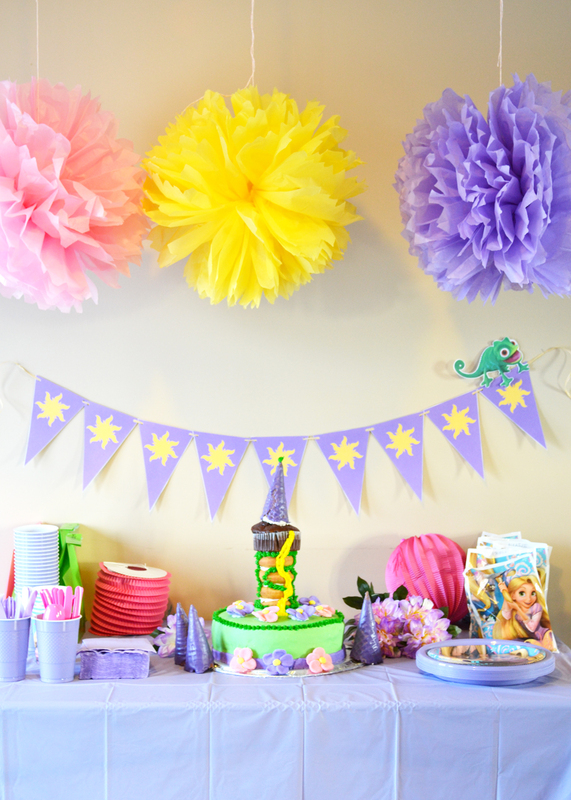 I hung tissue paper poms in pink, yellow and purple from the ceiling over the cake table. My daughter and I had a great time making them together using this tutorial. (Bonus: We used them as decor in her room afterward!) We made a simple banner (like the one in the Tangled movie when they are in the market) out of paper and string. The printable template for the banner flags can be found here. My daughter saw the banner and instantly requested that a “Pascal” (the lizard from the movie) be perched on it, so we found a picture of him online and printed it and cut it out! I had some paper lanterns from a previous party, so used those on the table, and we purchased some Tangled-themed treat bags and plates. 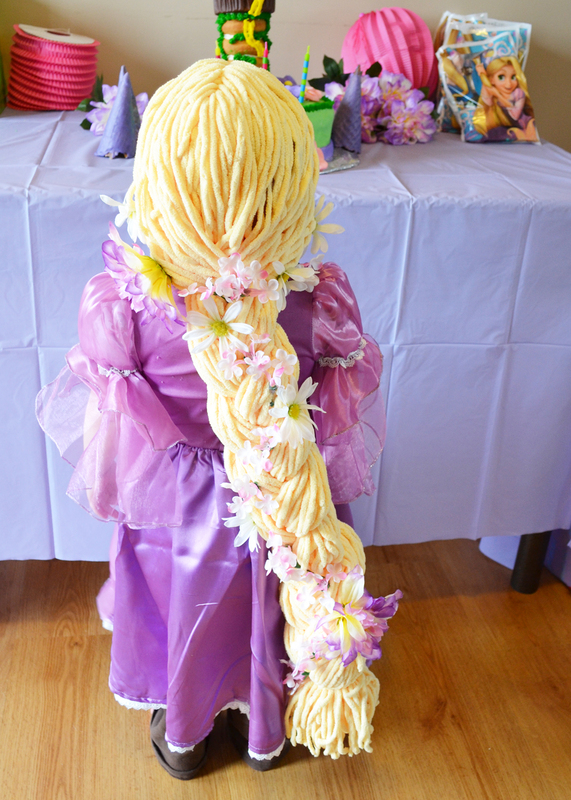 One of the first things my daughter requested when she knew she was going to have a Rapunzel party was a Rapunzel dress and hair! We found a dress to purchase online, but my very talented mother made a gorgeous Rapunzel wig using this tutorial. The yarn she chose was perfect – it was a buttery soft and fat acrylic in the perfect and softest shade of yellow. She glue-gunned flowers in the braid as a finishing touch. 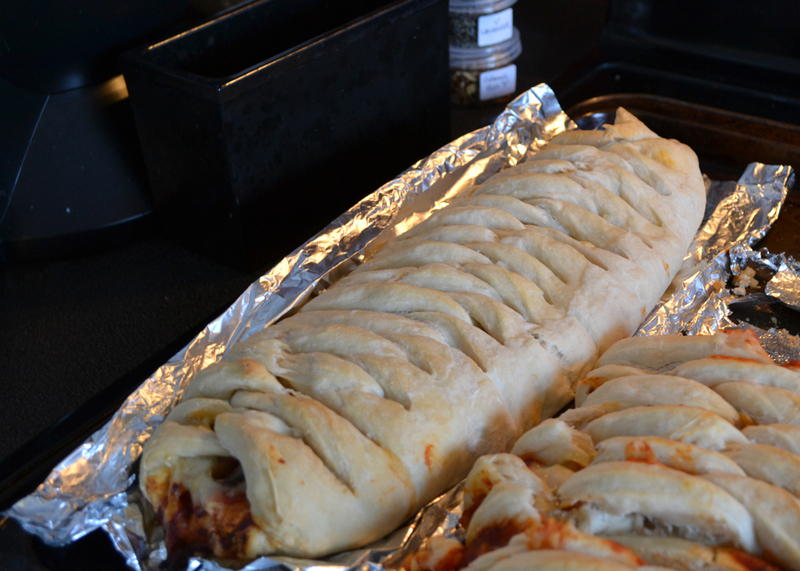 For the main dish, I had the idea to make these fun calzones that look like a Rapunzel braid! They were toddler-friendly and delicious. Rather than using a bread machine, I hand-made the dough the night before, let it rise for a couple of hours, put it in a large bag in the fridge, and then took it out the morning of the party. After it rose again for another couple of hours, I rolled it out, placed the filling in, criss-crossed the dough over the filling and baked them. In addition to the calzones, we had some simple veggie, fruit and cracker trays. We had a wonderful, simple Rapunzel-themed party and my daughter had a great time with her friends (and we had a good, solid sleep afterward)! Beautiful party ideas and fantastic job on the cake! Your little girl must have been thrilled!!!! Amazing!!! I love the cake, it came out great!!! Cool! My sister is into Frozen and Tangled………So thanks for the post!